When Bree's dog, Samson, goes missing, it's just the beginning of her life turning upside down. Bree Nicholls and her K-9 search-and-rescue dog, Samson, recover missing persons around the shores of beautiful Lake Michigan. Together they've become an unstoppable mystery-solving team. When a man working at a new plant near Rock Harbor dies under suspicious circumstances, Bree's involvement in the investigation leads to an astonishing find - family she didn't know she had. Then Samson goes missing. As she tracks down her loyal dog, Bree finds that the mysterious murder and dognapping are connected. The clues lead her to evidence buried deep in the wilderness of the Upper Peninsula. Park Ranger Kade Matthews steps in with his expert knowledge of the deep woods. Together he and Bree must track down the killer - and find Samson before it's too late. Kept me guessing who done it! Very fun story that kept me guessing who done it till the end. The narration is done well. very good storyline! great performance as always by Devin O'Day. story was kind of predictive. be warned there is dog fighting. I was very upset by the treatment of the dogs. even knowing it was fiction. 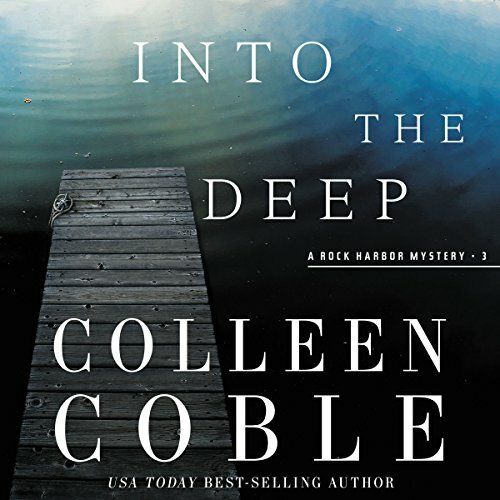 Colleen Coble manages to weave multiple threads of mystery into one tapestry,, filled with suspense, inner turmoil, romance, and comedic moments. Into the Deep was a joy to listen to. I was pulled into the story, trying to figure out the mysteries along with the characters. This is the 4th book in the Rock Harbor Series. We enjoyed this Series. Great Christian based story with a lot of trusts and turns. Great author and great narration. Who Is behind everything going on in Rock Harbor? Accept newcomers at face value. But when a beloved search and rescue dog, Samson is in the middle of a mystery and murders to newcomers happen. Another great addition to the series by Colleen Coble, read by Devon Oday.